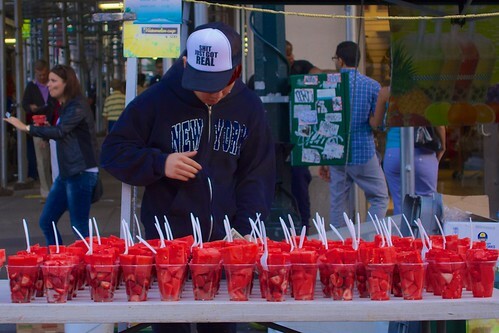 This photo was taken at a street fair, close to the corner of Broadway and 57th Street. The picture speaks for itself… even though I don’t really have a good explanation for this guy’s hat. Note: I chose this as my &quotphoto of the day&quot for Oct 21, 2013. This set of photos is based on a very basic concept: stroll each and every block of Manhattan with a camera, and see what takes place. To steer clear of missing anything, stroll both sides of the street. Of course, if you wanted to be a lot more ambitious, you could also stroll the streets of Brooklyn, Queens, Staten Island, and the Bronx. But that’s much more than I’m prepared to commit to at this point, and I’ll leave the remaining boroughs of New York City to other, a lot more adventurous photographers. Oh, in fact, there is one particular a lot more tiny detail: leave the photographs alone for a month — unedited, untouched, and unviewed. By the time I really focus on the 1st of these &quotevery-block&quot pictures, I will have taken much more than 8,000 pictures on the nearby streets of the Upper West Side — plus another a number of thousand in Rome, Coney Island, and the various spots in NYC exactly where I traditionally take pictures. So I never expect to be emotionally attached to any of the &quotevery-block&quot photographs, and hope that I’ll be in a position to make an objective selection of the ones worth hunting at. So, with the expectation that I’ll be looking at these every single-block images five or ten years from now (and maybe you will be, also), I am going to be doing my very best to capture scenes that convey the sense that they had been taken in the year 2013 … or at least sometime in the decade of the 2010’s (I have no idea what we’re calling this decade yet). Or perhaps they will just say to us, &quotThis is what it was like a dozen years following 9-11&quot. An additional example: I’m fascinated by the interactions that folks have with their cellphones out on the street. It appears that every person has a single, which undoubtedly wasn’t true a decade ago and it appears that everyone walks down the street with their eyes and their whole conscious attention riveted on this small box-like gadget, utterly oblivious about anything else that may possibly be going on (amongst other items, that makes it extremely straightforward for me to photograph them with out their even noticing, specifically if they’ve also got earphones so they can listen to music or carry on a telephone conversation). But I can not support asking yourself no matter whether this sort of social behavior will look bizarre a decade from now … specially if our cellphones have turn into so miniaturized that they’re incorporated into the glasses we wear, or implanted directly into our eyeballs. 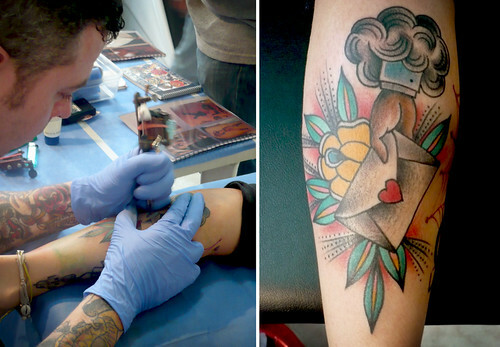 Steve Boltz de Smith Street Tattoo Parlour New York…. !!! !